NW Girls Ministries exists to equip churches and families as they minister to girls in today's world. and community by putting the Titus 2 principle into action: women training young girls. To find out more and stay up to date follow us on Facebook! plan for her life. Leaders use a time-tested achievement system that meets girls where they are developmentally, helping them build strong biblical foundations while experiencing fun and engaging activities (for a list of unit topics, head to ngm.ag.org/curriculum). What makes Girls Ministries clubs different? Girls Ministries is the premier ministry for preschool through high-school girls in the world. Our youngest ages combine boys and girls in the program. When boys reach kindergarten age, they are encouraged to join the Royal Rangers ministry. No other girls ministry program has our variety of activities, focused discipleship track, or a 60-plus-year proven track record of helping girls become confident, godly women who are leaders in the church, home, and world. Why do you need a gender-specific ministry? God created men and women with special differences. Research shows girls learn more quickly and deeply when they are taught by a role model. Girls need a real-life example. When a girl understands what it means to be a godly woman, she aspires to the design that God intended. A single-gender classroom has many benefits, but the greatest of these is for a girl to feel safe and secure in her discovery of who God intended her to be. This happens best by being mentored through a relationship with a godly woman. Looking for resources that seamlessly weave fun and biblical training together? Girls Ministries is for your group. 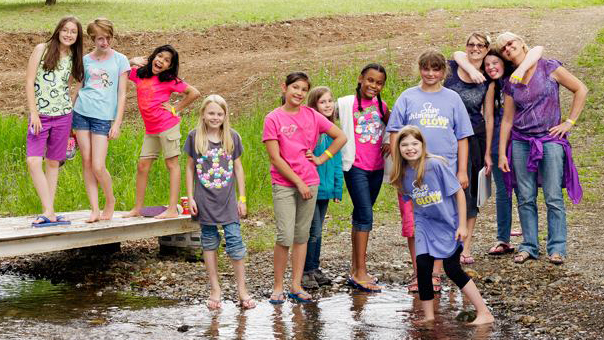 Adventures, activities, and games show girls how discovering God’s Word is fun! Lessons teach girls valuable life skills -- everything from sportsmanship and integrity, to cooking and outreach. Girls learn how to choose actions, attitudes, and behaviors that please God. Girls encounter difficult situations in their growing up years. By intentionally fostering relationships between girls and the leaders, Girls Ministries creates a safe environment for girls to discuss issues they face and get godly counsel. Girls Ministries is flexible. Meet whenever is best for your group. Most importantly, Girls Ministries shares with each girl that God loves her and wants to have a relationship with her. Units can be completed in as few as four weeks, which means visitors can easily follow along with the other girls on each topic. Girls have the potential to learn 242 Scripture verses. In the third- to fifth-grade level, girls begin a regular Bible reading routine and read the entire New Testament. In the Teen Girl Ministries (middle and high school) level, girls read the entire Bible and complete 6-week topical studies. Join other women who are leading and investing into the next generation of girls for a two-day event! Be encouraged as you meet other women, seek the Lord together, and learn from other women in Girl's Ministry. This event is great for all women new and seasoned! More information coming soon! Want to charter your group? Download charter application and compliance forms below.